A third-generation technology platform uses laser ablation to perform pulmonary vein isolation (PVI), blocking the abnormal electrical pathways that cause atrial fibrillation (AF). The CardioFocus (Marlborough, MA, USA) HeartLight X3 System combines direct tissue visualization, titratable laser energy, and compliant balloon technology to enable uninterrupted, high-speed, circumferential lesion creation under direct control of the physician, resulting in consistently reduced procedure times. The system is based on a near infrared (NIR) laser and a deflectable sheath that provides transseptal access to all four pulmonary veins. In a pivotal confirmatory evaluation study, the HeartLight X3 System achieved PVI in just three minutes for a single vein, potentially completing all required ablations in less than 20 minutes. 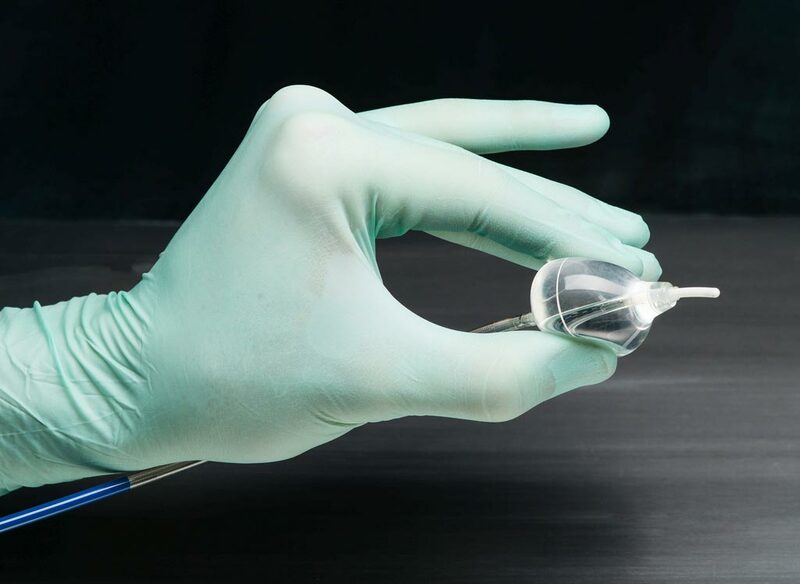 Image: The HeartLight Excalibur Balloon and HeartLight X3 System (Photo courtesy of CardioFocus). During the procedure, the HeartLight X3 Balloon is delivered using fluoroscopic guidance via a catheter; once in position, it is inflated. An integrated micro-endoscope is then used to visualize the placement of the balloon relative to the ostium of the vein. The physician can then use the endoscopic image to plan and execute the location of each arc of NIR laser light, placing overlapping arcs of light into the atrial wall around each vein. The scar tissue formed creates a conduction block with just several 20-30 second energy deliveries. PVI was developed to prevent focal triggers in the pulmonary veins from initiating episodes of AF. The procedure initially involved focal ablation with a catheter directly in the pulmonary veins, but isolating the pulmonary veins by applying ablation energy at their junction with the left atrium was found to be more effective. The PVI procedure is most suitable for patients whose recurring symptomatic episodes of AF that have not been suppressed by anti-arrhythmic drugs, or who do not wish to take long-term anti-arrhythmic or anticoagulation medications.